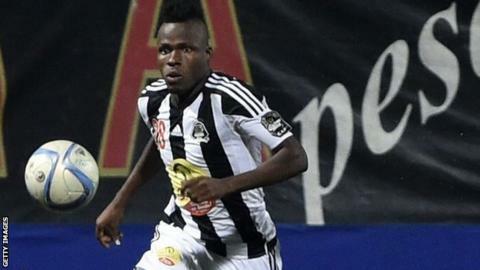 TP Mazembe of the Democratic Republic of Congo continued the defence of their African Champions League crown with a hard-fought 1-0 win over Saint George of Ethiopia in Lubumbashi. The victory over their stubborn opponents was enough to give Mazembe a 3-2 aggregate win and move the holders into the last-16 of Africa's premier club competition. After drawing 2-2 in the first leg in Ethiopia, Mazembe made sure of their progression at home with a late penalty from Jonathan Bolingi. Bolingi struck the 85th minute spot-kick after Ghanaian midfielder Solomon Asante had been fouled. The slender victory took the pressure of Mazembe's new coach, Hubert Velud. He replaced out-of-contract Patrice Carteron as coach of the African champions after Mazembe's disappointing showing at the Fifa Club World Cup. Mazembe will now face Wydad Casablanca of Morocco in the next round as they continue the defence of their crown. Wydad beat CNaPS Sport of Madagascar on Saturday. Elsewhere on Sunday, Vita Club, Stade Malien, ASEC Mimosas, Zesco United, Mouloudia Bejaia, Entente Setif and Al Ahly Tripoli all booked their places in the last-16. The 2014 runners-up Vita Club had to sweat before progressing through a 1-1 draw at Mozambican railways club Ferroviario Maputo. The DR Congo side, who earned a smaller-than-anticipated 1-0 first-leg advantage in Kinshasa, endured some anxious moments in south-east Africa before Mukoko Batezadio scored a minute into stoppage time. There was still time for 'Diogo' to equalise, but it was V Club who booked a round-of-16 date with Mamelodi Sundowns of South Africa. Algeria are another country who will have two clubs among the 16 survivors after 2014 champions Entente Setif and debutants Mouloudia Bejaia achieved contrasting victories. An early goal from Central African Republic star Eudes Dagoulou set up Setif for a 4-2 home victory over Etoile, who were always on the back foot after being held 1-1 in Congo Brazzaville. Bejaia ground out a 2-0 win over Tunisian visitors Club Africain to shade the North African showdown 2-1 overall. Senegalese Mohamed Ndoye converted a penalty just before the hour to nudge Mouloudia ahead and Morgan Petrongal scored the tie-deciding second goal six minutes later.